LEVEL: Difficult, but not at high altitude. Challenging due to steep ascents and descents. 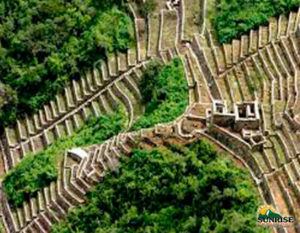 ADVENTURE RATING: Choquequirao trek is one of the better known adventure hikes around Cusco. Three-day Choquequirao Trekking Challenge is an excellent adventure package which lets you explore the breathtaking Apurimac Canyon and the Inca building of Choquequirao, the most important VX century Inca settlement in Cusco – Peru. 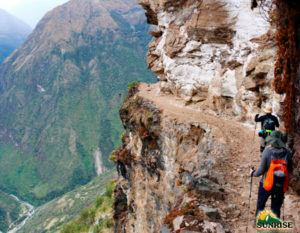 The trekking is challenge but one is rewarded by splendid views of the Apurimac Canyon, Vilcabamba mountain range and the iconic Choqeuquirao; the trail is open all year around but we recommended from April to November; during this time we are in the dry season; the rest of the year there is some landslides and the trail cam be closed. It is important to be in a good physical condition since this trek demands long distances each day. 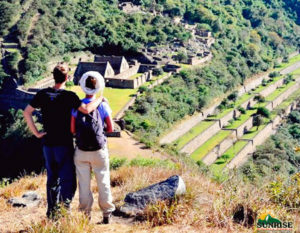 American explorer Mr. Hiram Bingham the first who visited the region of Vilcabamba in 1909 and since then, the Inca site of Choquequirao has turned out to be a daydream experience, for huge number of trekkers all around the planet. The daunting and rewarding Choquequirao Trekking Challenge gives the incredible opportunity to walk through the deepest Canyon and over the Capuliyoc’s viewpoint for capturing awesome panoramic views. Passing through Scenic Mountains, ancient Inca temples, several highland settlements, meeting generous people living along the route and understanding their way of life are some of the highlights of Choquequirao Trekking Challenge. Significantly, the last retreat of the Incas from where they offer resistance against the “Conquistadores”. This trek will entirely enchant you. The three-day Choquequirao Trekking Challenge starts once we pick you up from your hotel in the city of Cusco and travel four hours with a scenic view to Capuliyoc zone. Then, walk through the Apurimac Canyon; passing interesting villages and traversing the Apurimac River. 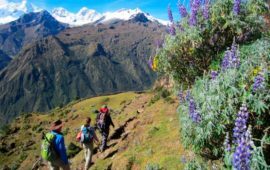 Our Choquequirao Trekking Challenge takes you to a national park, home for over 2,300 plants with flower from which approximately 300 are orchids; Also different animal species like mountain bears, deer, pumas, condors, chinchillas, and several other wild lives. Our Choquequirao Trekking Challenge takes you to xplore the mountainous settlements, valleys and canyons around the magnificent region of “Willcapampa”; accommodating in Camping tents and learning about the cultures of the famous Incas will leave spellbinding effect. 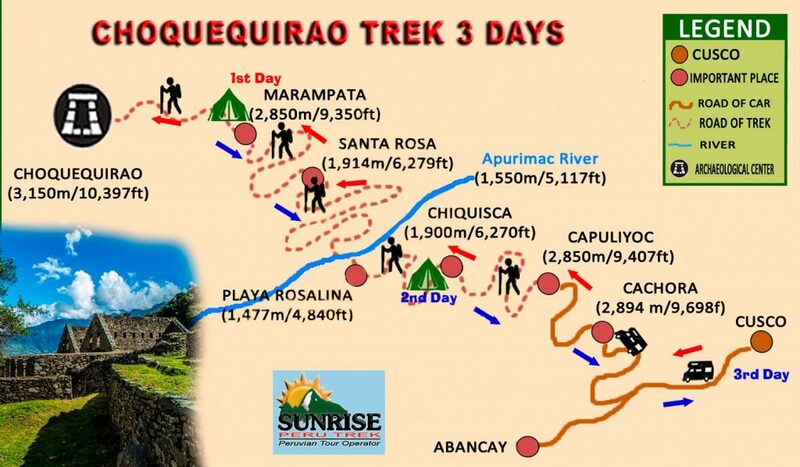 For Choquequirao Trekking Challenge, we leave Cusco very early by car to the zone of Capuliyoc and then trek for about 8 – 9 hours to Santa Rosa camp; today’s trek is considered hard and challenge. We continue very early the trail trekking up to the Inca ruins of Choquequirao; once we arrive, you’ll have a guided tour and free time for you own exploration, then we’ll return to Santa Rosa Camp. Today’s trek is considered hard but beautiful for the history and the great scenery. Early breakfast and continue the trek to Capuliyoc where our car will be waiting for us and return to Cusco. Today’s trek is considered hard and challenge but you’ll fill great because you just finish a wonderful trek. Our three-day Choquequirao Trekking Challenge itinerary has been carefully chosen to include the best night stops and highlights. However, as local and operational conditions may vary and unforeseen circumstances can arise, the following itinerary should be used as a guideline. Today we’ll Pick-up you from your hotel in Cusco at 04:00 a.m; then, we’ll drive our private car for four hours approx. to the town of Cachora where we’ll stop for a quick breakfast and also purchase some items for the trek (Water, snacks, etc. ); then, we’ll continue 30 minutes more to the zone of Capuliyoc (the starting point of the trek). Here, after we arrange the equipment on mules and horses, we’ll start the trek downward. The trail goes zigzag down until the place of “Playa Rosalina” where will be served our lunch and you can rest your knees that will be tired from walking down. After a deserved lunch in the middle of exotic views of the Apurimac river/Valley and the scenic mountains, we continue a few minutes down to the border of the Apurimac River, which will cross by a bridge; after that we’ll start the climb up by a zigzag trail to the campsite of “Santa Rosa” where you can take a deserve cold shower (the place is very nice and warm). And enjoy the views of the Apurimac Canyon. Here, there is a small village and you can also find a place if you want to buy some water, snacks or sodas. The approximate time of the hike is about 8-9 hours (Including the stops for lunch, resting and drink water). On this day, we will pass the small village, Capuliyoc (2,915 m.a.s.l.) impressive lookout point from where we can see the Apurimac Valley, Huayhuacalle (2,970 masl), Tinajayoc (2,630 masl), Mirador (2,370 m.a.s.l. ), Cocamasana (2,330m.a.s.l. ), Torowisqana (2,285 masl), Chiquiska (1,950 m.a.s.l.) grove place where we can find water, Playa Rosalina (1,550 m.a.s.l. ), La Huerta (2,705 m.a.s.l.) and finally, we’ll arrive to Santa Rosa camp (2,115 m.a.s.l.). Day 02: Trekking up to Choquequirao explore it and return to Santa Rosa camp. After an early breakfast, we’ll continue another hard section of the Choquequirao Trekking Challenge so, an early morning wake up is needed, where delicious breakfast will be waiting for you; the trail provides some clear water spring inviting to get it; we recommend do not drink water from the spring because the bacteria of the water are not good for your health. 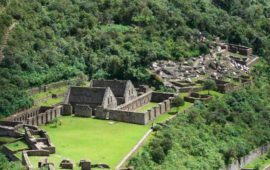 At around 9:30a.m, we’ll arrive to the archaeological site of Choquequirao where you’ll receive a guided tour; after which you’ll have free time for further exploration and also enough time to rest. While you are exploring the Inca settlement of Choquequirao you kitchen team will prepare your lunch which you will enjoy after you finish explore the extraordinary Inca settlement. 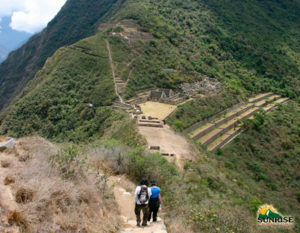 During the tour, we will observe the three levels of the excavated Inca settlement, where you’ll see the houses, terraces and other parts of this late Inca-town, like the ruin in progress of excavation and finally the areas unexplored that can tell us about this last refuge of the oppressed Inca Empire. After all, we start the walking down to the camp of Santa Rosa and enjoy your last dinner. 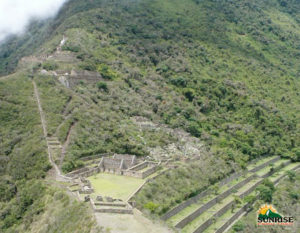 The Inca ruins of Choquequirao are considered as “The Last Refuge of the Inca Empire”. The oldest reports assign to Juan Arias Diaz as one of the first people that explored the zone in 1710. Our bilingual guide will explain the history and importance of the site. Day 3: Trek from Santa Rosa Camp to Capuliyoc and drive to Cusco. After an early breakfast, we’ll pack all camping gear and start walking down to “Playa Rosalina” It is the lowest point of the trek. On the way, we can observe one more time the Apurimac Canyon; if we are lucky, we’ll see Andean Condors flying over the Canyon. We also will see the exuberant vegetation and its variety of flowers and orchids. From “Playa Santa Rosa”, we’ll continue walking up to Chiquiska where we’ll stop for our last lunch and also you can rest; this is a very hot place so that we recommend drinking enough water. From the zone of Chiquiska, we’ll continue the trail zigzag up to Capuliyoc where our private car will be waiting for us and return to Cusco. Here in Capuliyoc you’ll have last choice to take pictures of the route, and see the trail that took us to Choqeuquirao. After all, we’ll take the car and return to the village of Cachora where the car will stop for going to the toilets and you also can purchase some items for your car trip to Cusco. We’ll arrive to Cusco at approx. 08:00 p.m and you’ll be transfer you to your hotel. The times cited in this itinerary are approximate. Walking times depend on the group and the guide can change lunch spots and campsites, depending on the progress of the group.